AutoQuad will use fast PWM frequencies on the motor ports. For now the frequency is fixed on 400Hz when using the port for motors. Connecting a standard (analog) servo for use as a gimbal can result in a non working servo because most (analog) servo’s will accept a PWM frequency between 30-100Hz. Digital servos can go as high as 400Hz, but typically work best in the 300-333Hz range. You can set the desired gimbal servo PWM frequency using the ground control software (QGC), on the Gimbal parameters page. AQ uses 6 different timers within it’s infrastructure. Within a timer you can only use one frequency. So, for using a lower pwm rate on a port you must use a timer that is not used by a motor. 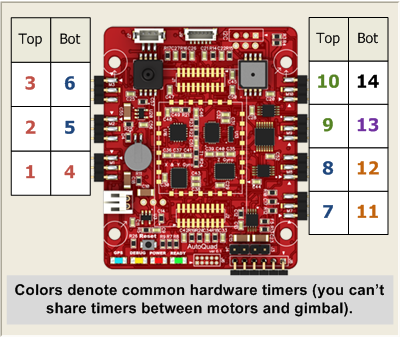 In this example 3 timers (1, 4 & 2) are used for 4 motors. The gimbals have separate timers. This page was created on 18-Jun-12 by menno. Last modified on 17-Oct-14 by jussi.